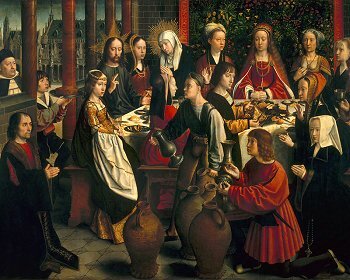 Did Jesus ‘dis’ Mary at the Wedding at Cana? Nope. The Gospel from yesterday recalled the Wedding of Cana (John 2:1-11). Reading the Gospel, it can appear that Jesus dishonors His Mother Mary. But does He? [ http://haciendaparrillaalta.com/producto/pack-6-botellas-tinto-parrilla-alta-2016/?add-to-cart=858 buy generic Lyrica online 1]On the third day there was a marriage at Cana in Galilee, and the mother of Jesus was there;  Jesus also was invited to the marriage, with his disciples. When the wine failed, the mother of Jesus said to him, “They have no wine.”  And Jesus said to her, “O woman, what have you to do with me? My hour has not yet come.”  His mother said to the servants, “Do whatever he tells you.”  Now six stone jars were standing there, for the Jewish rites of purification, each holding twenty or thirty gallons. Jesus said to them, “Fill the jars with water.” And they filled them up to the brim. He said to them, “Now draw some out, and take it to the steward of the feast.” So they took it. When the steward of the feast tasted the water now become wine, and did not know where it came from (though the servants who had drawn the water knew), the steward of the feast called the bridegroom  and said to him, “Every man serves the good wine first; and when men have drunk freely, then the poor wine; but you have kept the good wine until now.”  This, the first of his signs, Jesus did at Cana in Galilee, and manifested his glory; and his disciples believed in him. Jesus does not call Mary “Mother” or “Mary”; instead, He calls her “woman.” Sounds kinda insulting. It is important to realize at the start, that John (the author) places Mary at the heart of the story, mentioning Mary first; even before Jesus. Mary is clearly revered by John and he places great emphasis on Mary in this miraculous event. In the Gospel up to this point, the author John has building a comparison to Genesis (John 1:1 starts with “In the beginning” just like Genesis 1:1; John’s narrative follows the 7 days of creation). In Genesis, the first woman Eve, is called the “woman” (Gen 2:23). When Jesus calls Mary “Woman”, He is suggesting (actually pronouncing) that Mary is the New Eve. Quite an honor! Eve prompts Adam to eat the fruit which leads to the fall (Gen 3); Mary prompts Jesus to resolve the lack of wine (probably assuming that Jesus will perform a miracle) and Jesus performs the miracle which begins His public ministry which leads to our Salvation. Where the first Eve fails, the New Eve succeeds. This should not surprise, for Mary is the Immaculate Conception, born without Sin. When Jesus says “What have you to do with Me?”, He is not dishonoring Mary. In the Old Testament, the phrase is sometimes hostile, but not in cases where a request is being made. But in the New Testament, it can be a phrase of submission (see Luke 8:28). An alternative (and acceptable) translation is “what is this to you and Me?”. Using this translation, Jesus is commenting that He knows that performing the miracle will initiate His public ministry, leading to His death. Mary, may not realize that is what her request will start. Again, this is not a rebuke; rather, Jesus is highlighting the difference in His perspective and Mary’s. It is critical to note that Jesus actually immediately complies with Mary’s request and performs the miracle; hardly a rebuke. In John 2:12 (the following verse), Jesus went down to Capernaum “with His mother”; obviously Jesus did not rebuke or shun Mary and Mary did not feel rejected, for she was with Jesus. And if all the above is not convincing, one should remember that Jesus is the Son of God, He loves the Father and His Mother. He is perfection itself; and the Perfect Son never would dishonor His Mother.